Ranunculus lyallii, the Mount Cook Lily The flower is actually a giant mountain buttercup. Kowhaiwhai (Maori rafter panel design): My design ‘Maunga waka’ representing the mountain and the waka tipping over. When Raki and Papatuanuku were married, Raki’s children Aoraki, Rakiora, Rakirua and Rarakiroa came down to meet their new mother. The brothers travelled on a canoe named ‘Te Waka o Aoraki’ (The canoe of Aoraki). Upon arrival they explored for a while and got to know Papatuanuku. Eventually however it was time to return home so the brothers said a karakia and their canoe began to ascend towards the heavens but the incantations failed and the canoe fell back into the sea and rolled onto its side turning to stone. Aoraki and his brothers climbed onto the highest point but sadly they turned into stone. 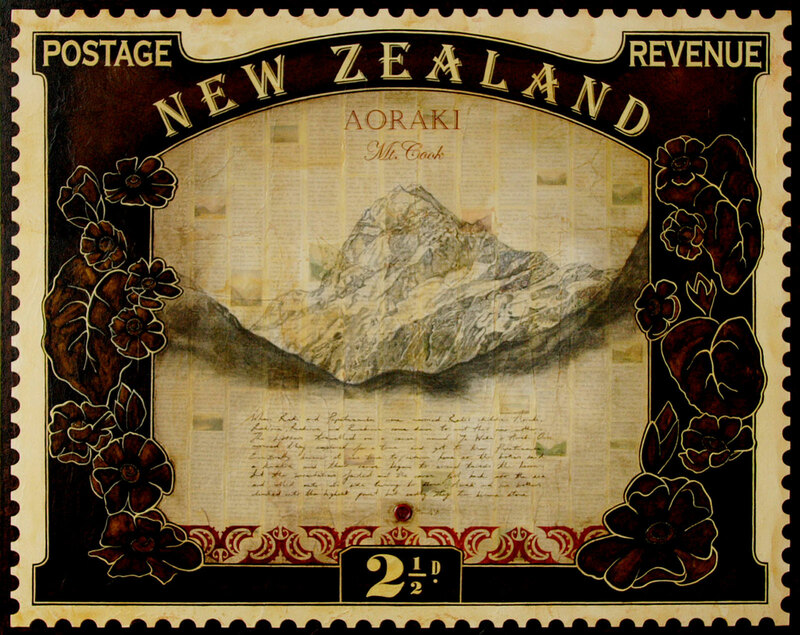 Aoraki and his brothers are now known as Mt. Cook and the Southern Alps. Note: Raki is South Island dialect for Rangi, the sky father.